Detroit January 7, 2019; A panel of 30 or more police officers from departments as large as Los Angeles or a country sheriff helped shape the look and safety features of the 2020 Police Interceptor Utility, available as a hybrid sedan, F-150, Expedition SSV, Transit PTV and SSV Plug-In Hybrid Sedan. The modified Explorer is expected to command the most sales. Greg Ebel, the police liaison for Ford Motor Company’s police vehicle division said Ford accounts for two-third of police vehicle sales in the United States because products are field tested by the country’s finest officers. “These are purpose- built vehicles, every feature is thought through,” Ebel says. New models have perimeter alert with sensors to monitor 270-degree area around the vehicle to alert an officer on stakeout – or savoring a donut – to possible harm. As someone approaches the chimes ring, the windows roll up and the rear camera turns on to identify the prowler. Motion trails of the detected threat appear on the digital instrument cluster. Police officers on the Ford panel wanted – and received - trimmed seat bolsters and vinyl seats so officers with duty belts can slide in and out of the vehicle without some onerous stuffing or carpeting catching them on the way out. The floor is plain vinyl, so it washes up easily, even through the murkiest of circumstances. 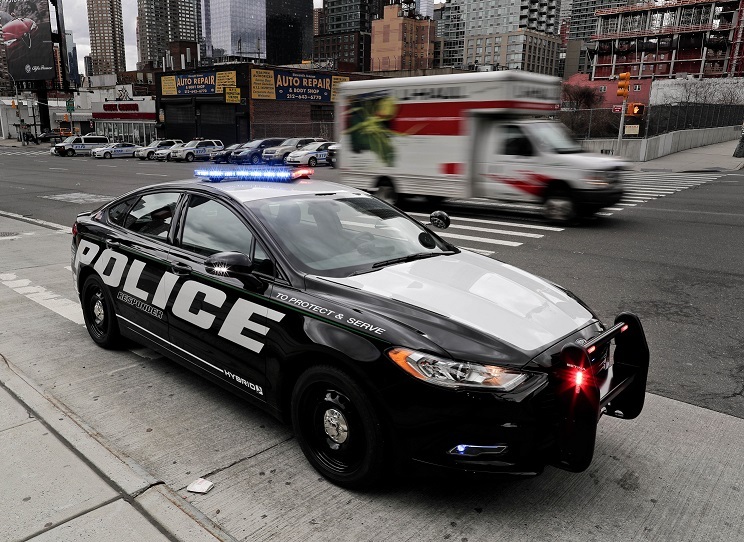 The Police Interceptor Utility comes with standard hybrid all-wheel-drive powertrain, saving police agencies and taxpayers as much as $5,700 per vehicle annually in fuel costs, compared to current models with 3.7-liter gas engines. Hybrid technology works better than gas engines when police vehicles are stationary because the power to run emergency lighting, radios, computers and other on-board electrical equipment. Electrical features run on its lithium-ion battery, thus reducing fuel use and CO2 emissions. “Officers take care of people in our communities, so we feel it’s important that our vehicles help take care of our officers,” said Stephen Tyler, Ford police brand marketing manager. The new Explorer utility vehicle has a projected EPA-estimated rating of 24 mpg combined, a 41 percent improvement over the current model with a gas engine. Some weight is added by a steel brace on the back and to save a police officer’s life if rear ended by a vehicle. Two Michigan State Troopers were injured in 2018 when motorists slammed into their cars on highways, sending them to the hospital for concussions. How to help? The Ford vehicle meets Ford’s stringent 75-mph rear-impact crash standard, while the federal standard is just 50 mph. The police vehicle is tested by police officers and safety teams within Ford Motor Company for police durability. This includes improved cooling, specially tuned braking system, front-door tethers, and police-purposed steel wheels, tires and hubcaps that are designed to withstand the rigors of a chase. The vehicle is also tested for eight-inch curb impact, median crossing and 30-mph railroad crossing validity. It can ford water to 18 inches at 15 mph and 10 inches at 40 mph, making it mighty helpful in flood situations. Saving lives is an integral part of police vehicles, but these cars must go fast. At the Los Angeles County Sheriff’s Department Testing, the new police hybrid bested the outgoing 3.7-liter model in the 0-60 mph by 1.1 seconds and 0-100 mph by 4.7 seconds. It also turned the fastest lap time that was 2.4 seconds better than the 3.7-liter and fastest average lap time that was 1.7 seconds better. Testing by the Michigan State Police found the hybrid had the fastest 0-100 mph, fastest, lap, and highest top speed of 137 mph, versus competitive police utility vehicles tested. All is well and good, but none of us want to see those flashing lights surging up from behind when you coax the accelerator beyond the legal speed limit.